The trip to the most attended race each year in the Georgia Dome proved to be an off night for the entire team. For the 2nd consecutive week the track was built with clay and increasingly slippery as the evening progressed. A slick and technical track is very difficult to pass on so bad starts equal less than stellar finishes and that is what the night equated out to. 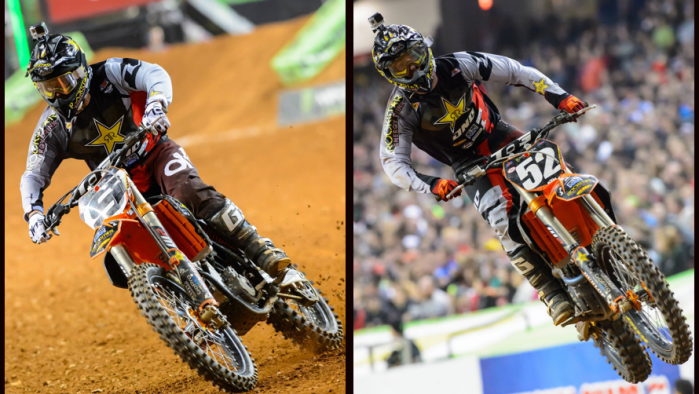 On a positive note however, both riders left Atlanta healthy putting a track that saw a plethora of crashes behind them. Ivan Tedesco has been consistent in his heat races thus far in 2014. In fact he has been one spot out of qualifying in what seems like nearly every round. If he could just find a way to be one position faster, he could make things a lot easier on himself and be less fatigued entering the main, as well as obtain a more preferred gate choice. That's easier said than done however as every rider finishing in front of Ivan each week has either won a professional championship or at the very least 450 main events. That's a testament to the level of talent currently fielded in the premiere class. Tedesco was able to successfully transfer out of the semi again however, thus skipping the dangerous last chance qualifier. As the gate dropped for the main event, he just didn't get a good jump at all and decided to cut to the inside. The result was not good as he started in the back. He made several passes and moved near the top ten before his progress stalled. He engaged in a battle with Josh Hill and a little game of cat and mouse ensued. IT ended up on the short end of that commotion as he was unable to jump the big triple and lost positions in the process. He was able to recover enough and fight through to regain a couple spots but was certainly displeased with his performance overall. Ivan Tedesco: "Rough night for me in that main. I got a bad start and was on the outside. I got arm pump like the 5th lap in and I was honestly struggling just to finish the race. I don't know what happened, I just got tight. That's about it, I finished 14th, pretty bad. Just going to move onto the next one which is all we can do." Cole Thompson had a much better day in Qualifying practice than the inaugural East Coast 250 round a week ago. Then in his heat race he had a good start and was near the front. As the track winded around and crossed back over the start, there was a fairly large double out of an off camber turn. Cole spun coming up to the jump and still went for it. He was not even close and cased it about as bad as physically possible with out going down. In fact it was a miracle the he stayed up after hitting his face on the handlebars and leaving a huge divot in the ground. He recollected himself and went on to qualify anyway. In the main event he had another good start but unfortunately came together with Blake Bagget going down the straight and ended up near last place exiting the first turn. Sprint speed is very important the first few laps, especially when getting a bad start. Moves need to be made quickly so riders can be picked off in bunches before things spread out. The first few laps is where Cole has been struggling. He was still able to make his way back in the top ten though which is commendable for anyone on that track. After the race Thompson put the blame solely on himself. He stated that everything around him is excellent and that he just didn't perform. Perhaps Cole is being too hard on himself, or maybe that is just what he needs to do to take that next step. He has top 5 speed and it won't be long before he figures it all out. Cole Thompson: "Not my best night of riding, I finished 8th. Got a bad start and wasn't really aggressive the first few laps. The track was tricky tonight and I just didn't make things happen quick enough." The series now heads to Indianapolis and Lucas Oil Stadium. Another round that sees 60,000 plus spectators. Tedesco will work on his speed and getting out of the gate better. Thompson will focus on the early laps, aggressiveness and sprints to put himself where he feels he should be.